VAN WYCK GAZETTE-E-Books vs Print Books How Should I Read? E-Books vs Print Books How Should I Read? People have preferences, of course, but does it really make a difference when it comes down to it? As a lover of literature, a technologically savvy millennial and sniffer of old books in one, I’m just here to give you my opinion. I’m 25 years old, which means that I grew up on the cusp of today’s internet obsession and good old-fashioned “play outside until Mom flashes the lights” type childhood. This rapidly evolving time-lapse gives millennials an interestingly unique perspective on the issue of print versus electronic media. While the younger generation craves that instant gratification of live-tweeting, we remember the 45 minutes our dial-up used to take before we could even check our MySpace. Conversely, we grew up able to check the news online the day it happened rather than waiting for a newspaper to come out the next day or even the next week. This perspective combined with my six years of literary education has resulted in me thinking a lot about reading on a device rather than reading a physical book. They have the convenience that satisfies the burning need for instant gratification. Just finished the second book in a trilogy at two o’clock in the morning? That’s okay, the final book can be immediately downloaded to find out what happens next. When I am travelling, I like to bring several books because I read a lot or may not know what I’ll be in the mood to read. Rather than carrying a bag full of books, I can just download a few on my e-reader and pick one on the plane. Better still, if I travel somewhere I don’t speak the language, I can still purchase a new novel online in my home tongue. A backlight on an electronic device also makes reading at night so much easier. There’s nothing worse than falling asleep while reading, only to have to get back out of bed to turn out the light. My personal favorite use for e-readers, especially being an English major in college, was reading my assignments on them. If I didn’t know the meaning of a word, I could look it up right there on my device. Taking clear notes right on the page was easier than ever (and I didn’t need to mark up a physical copy of a novel, something that always makes me cringe!) The greatest part for me as a student was that so many of the classic novels I needed for school were FREE. Even the ones that weren’t free cost so much less than purchasing them at the bookstore. The convenience supplied by this technology is simply unmatchable. E-Books make being an avid reader (not to mention an English student) so much easier. Of course, there is much novelty and culture missed when one forgoes print books for their electronic counterparts; not to mention, print books have conveniences of their own that e-books cannot match. Holding a book in your hands is worlds different from looking at it on a screen. That coupled with being able to physically turn the pages makes an enormous difference to many. The smell and feel of a book for lots of people adds to the overall experience of the story, allowing them to become completely submerged in a new world. Sometimes it is easier for a student to take notes directly on the page, so he or she can flip right to it in class. 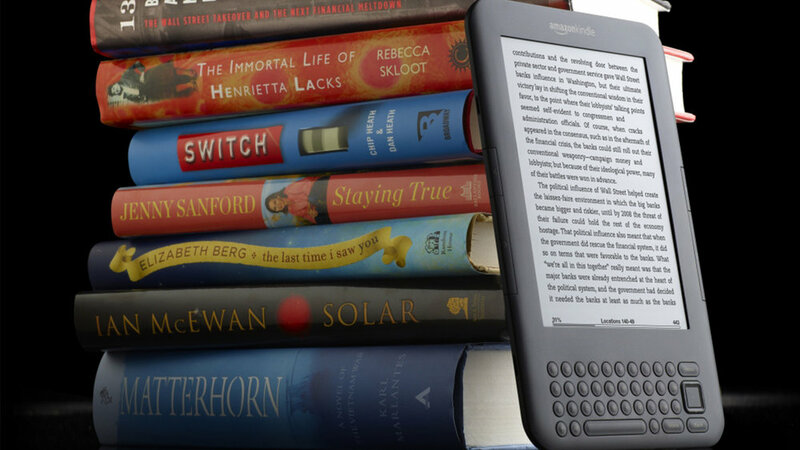 E-Readers are often not just for reading; they usually function as an entire tablet as well. This can be a positive or a negative. It’s convenient, but if you’re getting really into a story and suddenly your “book” dings with a new email notification, you’re bound to be tempted to check your email, or at least just be jolted out of your reading zone. While it’s nice to have a backlight for reading in the dark, reading at the beach or outside at all can be more challenging on an e-reader; paper doesn’t have a glare. Admittedly, there are e-readers with screens designed to prevent this issue, but the other problem that comes with perks such as lights and attached dictionaries is the battery life. While the batteries on most e-readers can last for long times, they inevitably do run out. A paper book will never run out of battery. If you don’t have access to electricity, you can still entertain yourself for days on end. The final positive for paper books that I want to bring up is actually an opposite positive for electronic reading: that instant gratification we’re all so fond of today. Sure, it’s great to have the next installment when you want it, but what about cliffhangers? An age-old technique to get readers to stay involved, with today’s technologies is becoming more difficult. It happens with television shows as well because of the advent of services like Netflix and Hulu; when one episode of a show is over, we move right on to the next one. The way series were created, we were meant to spend time wondering what will happen next. Between the sixth and seventh Harry Potter books, I spent months wondering who RAB was. After Ross said “Rachel,” we had to wait an entire week before we found out if Emily would give him another shot. Now, we can download the next episode or book instantly and never work out for ourselves what we think might or should happen next. Occasionally it does happen that we need to wait for the next installment to be released, but otherwise the wait and wonder time is minimal. When forced to choose between the convenience of an e-book and the timelessness of a physical book, many will stick with tradition. After reading all that, you’re probably thinking, “okay, so what’s the answer?” In my opinion: it doesn’t matter! As long as you’re reading, you’re educating and entertaining yourself. It’s cold outside, so grab some hot cocoa and your favorite book, no matter what form it’s in, and curl up next to the fire and READ.